Not a bad thing to take a breather after the intense showdown that involved Stain the past few weeks. There is an entire class of characters that we’ve gotten to know a little, but little chance to actually see how their internships are playing out. They had the options of either focusing heavily on one character or spreading it out for everyone. Both have their pros and cons, but I’m fine with them mostly giving ‘Froppy’ the main focus for this episode. We still got another quick series of scenes showing how the other characters are handling their internships. There are certainly a variety of experiences these kids are getting the chance to go through. One would hope that most of these students will gain something useful going forward. Sadly I don’t think Momo will be one of them…basically her internship has involved being a sidekick to an idol. I think the person who is gaining some of the best experience out of this is Ochaco. She chose this internship specifically to improve herself and be able to handle more situations. And she is gaining the exact kind of combat lessons that she wanted. We only got to see her lesson on dealing with knife wielding attackers, but can imagine she’ll gain a lot of experience by the end of it. And frankly as we’ve seen…bladed weaponry is still a thing. She’s building up a base of experience that she can further improve later. Considering some students probably don’t feel like they made a good pick for their internship, it is nice to see someone satisfied with their choice. At the same time, I do think some of these experiences are useful. Bakugo does need to confront his weaknesses. Best Jeanist does have fair points. It is a good thing for heroes to build up a connection with the community and the public in general. Having a sense of trust is useful in a crisis. There is value in having people know who you are and feel like they can trust you. Bakugo just doesn’t understand this concept yet. Even a scumbag like Endeavor understands the value in being sociable in public and with civilians. 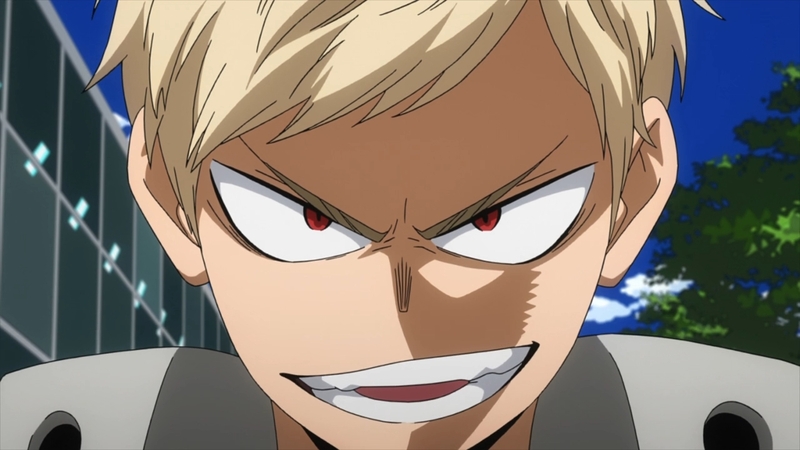 Bakugo’s focus is very narrow. It is important to stop criminals and fight well. But that isn’t the entirety of their jobs as heroes. While Bakugo may dislike this internship, hopefully he takes some lessons away from it. It was interesting to see the various experiences though. 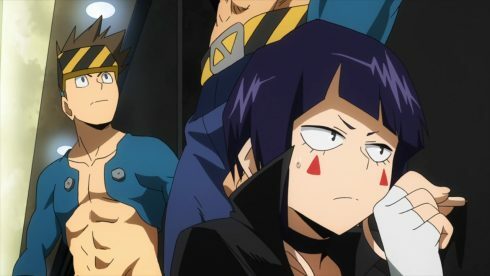 Jiro seems to be having a pretty good internship. She got to help out with some hostage rescuing and gain experience without facing too much danger. Of course all these internships have some risk, but hers went pretty smoothly. And it is nice that she was able to work with a pro able to make full use of her quirk. Things went far better for Jiro than say Momo. Sure she didn’t face any danger during her internship, but I’m not sure she learned anything useful either. I guess if she or Itsuka want to become a celebrity this could be a useful experience? I guess one can say Tsuyu’s experience was a mixed bag. It started out pretty boring and uneventful. One wouldn’t exactly expect a hero internship to just involve manual labor and cleaning up a ship. Though I suppose that is a fair responsibility since she chose an internship at sea. Someone has to do those jobs so things can move smoothly. 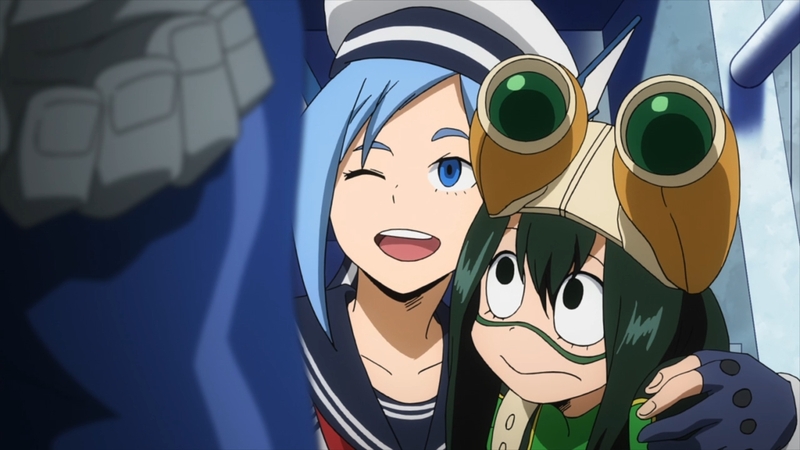 If nothing else Tsuyu did learn some good lessons along the way during this internship. The value of trust was apparent in this episode. If everyone didn’t have faith in each other then the villains would have gotten away. 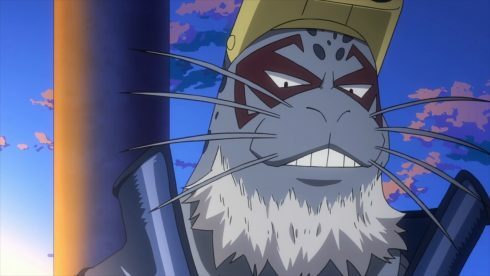 Trusting Selkie to get himself out of that situation allowed them to track down the villains. Then trusting once again allowed him to move in to support Tsuyu and Sirius. It was a risky situation, but one that worked out in the end. This did show more of how some internships were supposed to go. Jiro was relatively safe during her internship. Although there was always a chance that wouldn’t go according to plan and she might have to defend herself. The same was true for Tsuyu here. Selkie kept her away from the scene initially in case the unexpected happened. And then she and Sirius went to track down and locate the villains. But things didn’t go according to plan and they were forced to face a villain. But even then it wasn’t nearly the extreme situation Deku and company faced. Tsuyu mostly avoided direct combat (until the end). She did her job in reporting in and trusting that backup would arrive to help. And nothing wrong with showing how she isn’t ready for outright fighting villains. There is a difference between the thugs Tomura picked up before and serious villains. Overall it was a decent episode. It was a bit of a breather after the intensity we’d had going for the last while. 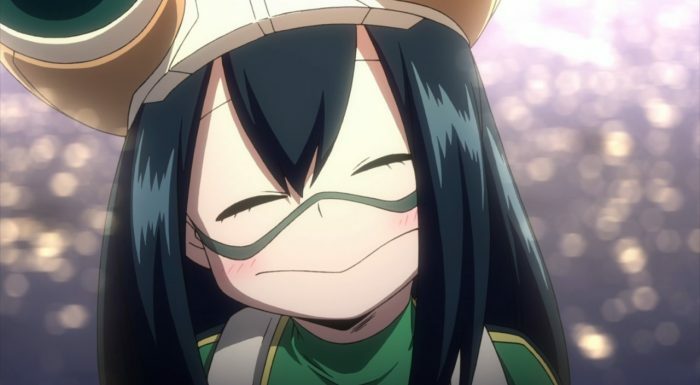 Tsuyu isn’t my favorite character, but nothing wrong with following her around a bit. She hasn’t had much focus this season and giving her the chance to do something was a nice move. While I wouldn’t have minded spending another episode focusing on other internship situations, it looks like we’re getting back to school with the next episode. Considering how the preview framed it…I’m pretty excited to see it. This was an enjoyable episode, but getting some serious background information with All Might is an exciting opportunity.